new challenge for August - Things With Wings! one (or more if you wish) butterfly, dragonfly or bird. please do follow our rules which you can check out here. projects to inspire you to join in. 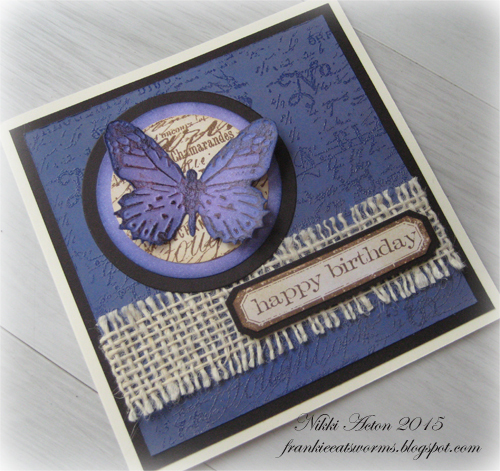 I absolutely adore Tim's Perspective Butterfly stamp and some of the latest colours of Distress Ink, Blueprint Sketch (with a wonderful lavender hue) and Cracked Pistachio and of course, the new Correspondence papers. You can see more detail over on my blog. 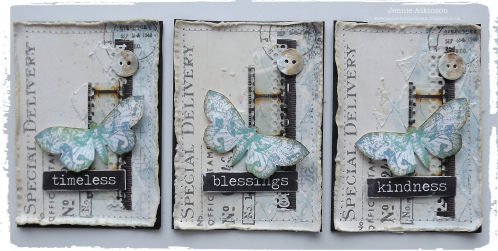 I have always loved the large butterfly from the Papillon Stamp Set, so I decided to make a trio of ATCs using Faded Jeans and Broken China Distress Inks and Sprays. I am just loving these little Correspondence Stamps and large Chit Chat stickers which are all just the perfect size for these little pieces of art. Please do join me on my blog if you would like to know more. I love the elegance of wings on my craft projects be it from a Butterly, Bird or a Cherub for the perfect finishing touch. 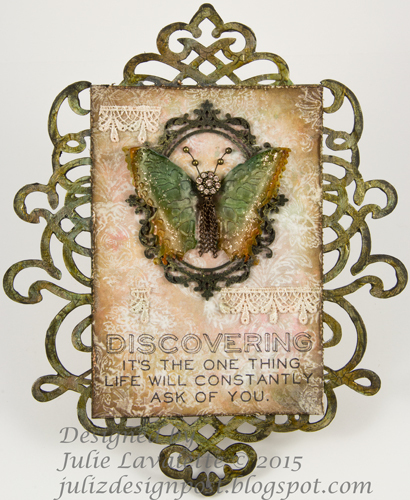 Please pop over HERE to my blog Juliz Design Post to see my tutorial and techniques used on my Butterfly. 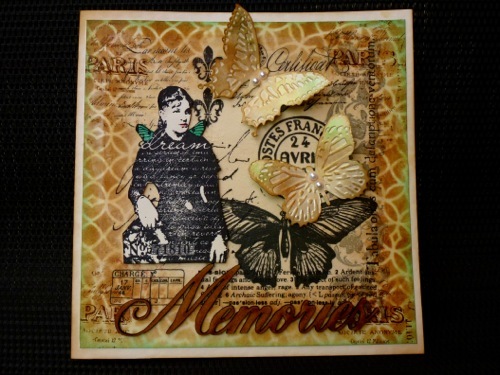 What a wonderful challenge theme Anne has picked.......especially as I so love Tim's butterflies, dragonflies and birds dies/papers. For my project I chose to go with butterflies, applying perfect pearls to their gorgeous embossed wings. I just love the way the PP twinkles in the light. From the moment I saw this Bird Silhouette die I fell in love... so Anne's Things With Wings theme was a wonderful chance to get him out to play for the first time. 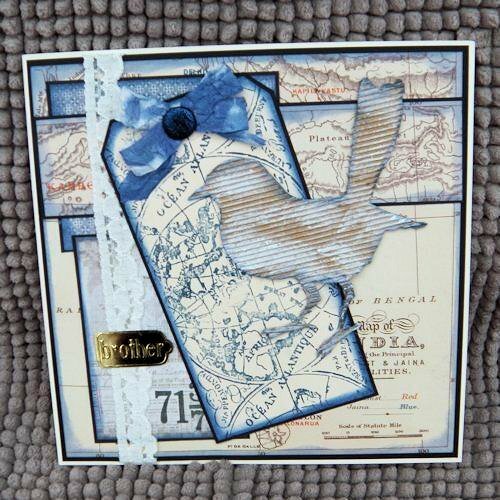 I've used one of my favourite stencils and some texture paste to create a simple burlap canvas to show him off. He's even perched on a real twig! Come over to Words and Pictures if you'd like to see all the details. 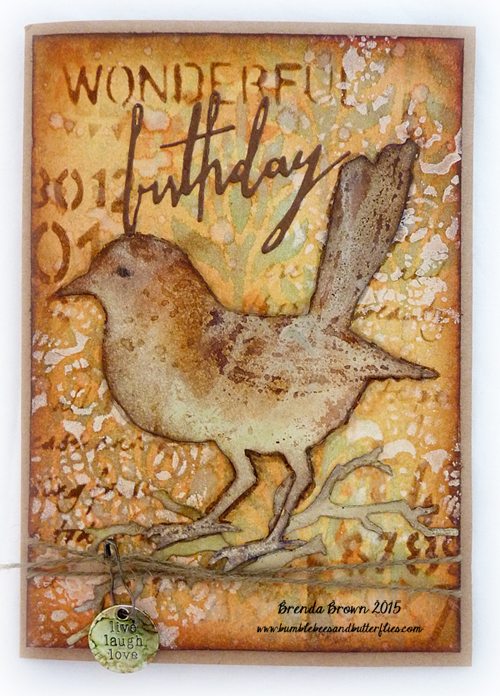 Anne's Things With Wings Challenge was just the thing I needed to push me to finally color up a Bird Crazy bird! I layered her to a stenciled brick Cabinet die over a burlap panel that was covered in Crackle Paste and Distress Spray Stains. Please fly over to my blog if you'd like to see more photos and details! I took the opportunity to use Anne's great challenge theme to make my hubbie's birthday card. He loves watching and feeding the birds so Tim's new die is perfect. Find out on my blog how I used the new micro glaze to achieve the mottled effects and make him look more realistic. A card from me today using the Butterfly Duo Bigz die, an attempted Tim technique and distress paints and inks. Hop over to Addicted to Art for more details. Are you feeling inspired? We hope so and we are so looking forward to seeing all your projects for our Things With Wings challenge! FABULOUS projects from you all, wow, a true feast for the eyes! Stunning each and every one ladies, you all rock!! (And sir Tim should be proud to have you showcase his products)! What a wonderful lineup of talent and some gorgeous artwork! Love all the "Things With Wings" and can't wait to visit! Hugs! Fabulous winged projects fellow Creative Guides! Just off to visit you all now the wifi is back !!!! 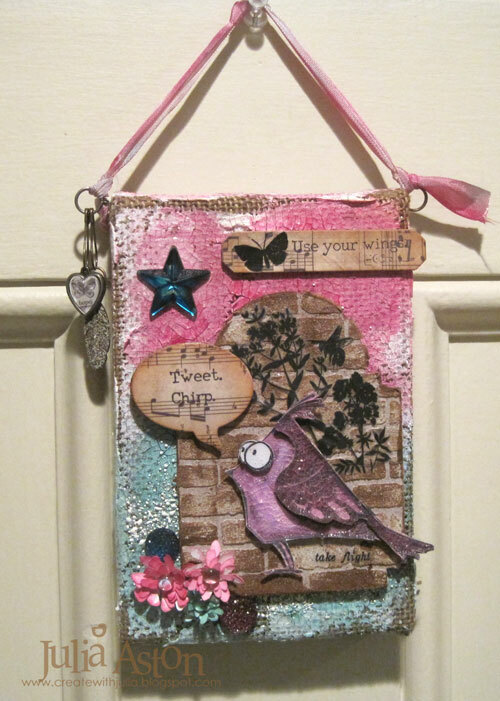 Just made my visits around all my Teamies blogs, great inspiration and crafty tips. Fab challenge Anne and I am sure our followers will love joining in as much as we did making our projects. Gorgeous projects... looking forward to spreading my wings and flying round to visit them all in more detail on Sunday! 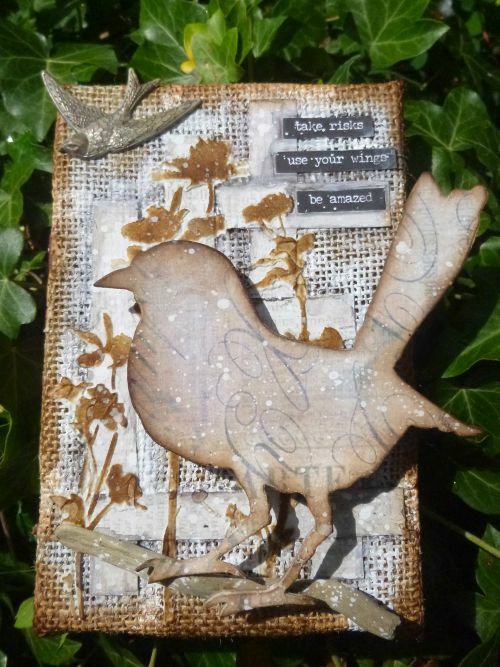 A wonderful theme and fabulous inspiration from the Creative Guides, off to find my wings! Thanks for all the fabulous inspiration and for the fun challenge! So many amazing creations! Thank you for the inspiration, everyone!